The price of the Aircrew Identification Card has been USD 100 as of 1 January 2019. If an out-of-date IBAC Aircrew ID Card Application is submitted, the $100 price will be maintained. Replacement Crew Cards will incur a fee of USD 30, unless the replacement is due to IBAC error. RECEIVING YOUR AIRCREW CARD ON A TIMELY BASIS: Please note that due to our experience with significantly delayed Aircrew Card shipments via domestic postal services over the last several months, we strongly recommend sending your Crew Card(s) via express services. For DHL, please add USD 25 to your order or provide your organization’s DHL account number. For FedEx, please provide your organization’s account number. 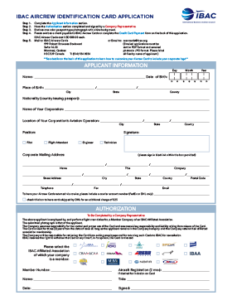 Please download the form below to stay completely up-to-date! The Card may be customized at the request of the operator to include their corporate logo in the top right-hand corner. The logo of the affiliated national or regional association of which the operator is member also appears on the card. 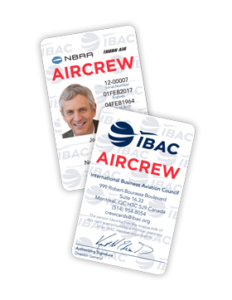 Facilitation and/or security personnel, particularly outside North America, expect to see the IBAC Aircrew Card and are more confident in their appraisal of the individual presenting the card once they are aware of the issuing authority. From time to time, crewcard holders have been granted certain discounts, such as crew rates at hotels, upon presenting the IBAC Aircrew Card. While IBAC has no objection to this use of the card, it must be understood that this is not its intended purpose. The card will be issued only at the request of the designated company representative whose company is a member of one of the fifteen affiliated national or regional associations. Below is a sample of both sides of the IBAC Aircrew Identification Card. Widely recognized by security officials, the card is made with a thermal transfer process, dye sublimated with the IBAC logo to prevent tampering or forgeries.